NEWSAn Inspiring Waiter Did This To The Disabled Woman And It Went Viral! 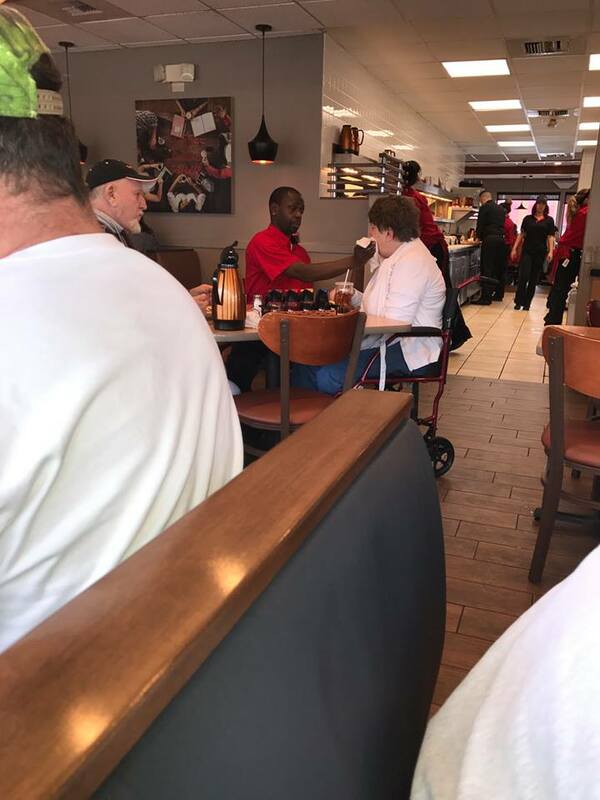 A touching moment was caught on camera at an IHOP in Springfield, Illinois, this week. The IHOP server has been identified as Joe Thomas, who has worked at the breakfast restaurant for 11 years. The woman in the photo has Huntington disease, which causes the progressive breakdown of nerve cells in the brain. She comes in once a week with her husband. Thomas said he noticed that each time the couple came in for a meal, the woman’s husband would help his wife eat first while allowing his food to go cold. One day, Thomas decided to sit down at the table and feed the customer while allowing her husband to eat his food. Thomas would have continued the weekly ritual without any recognition outside of his community if another customer hadn’t witnessed his act of kindness. Thomas says he hopes his story will inspire others to follow in his footsteps. Man Found A Lifeless Bear Cub. What He Did Next Will Melt Your Heart.